Proper treatment planning is essential for successful outcomes, particularly with interdisciplinary dentofacial therapy (IDT) cases of skeletally mature patients who require orthodontic tooth movement. As such, pretreatment assessment of the periodontium is commonly evaluated by clinical measures and conventional two-dimensional radiog raphic review. 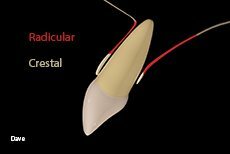 In IDT cases, particularly those involving the worn or malposed dentition, positioning teeth for an optimal anterior protected articulation may not be feasible as a result of the lack of available dentoalveolar bone along the entire root surface.